Just west of Shanghai, China is the prosperous city of Kunshan. At the end of August of this year, the city launched its automated bike-sharing program, Kunshan Public Bicycle, with 3,000 bikes in 150 stations. At the beginning of this month, according to Kunshan News the system is reporting phenomenal usage figures. There are 79,000 subscribers, or card holders, with bikes being using on average over 16.6 times a day. The highest one day usage was 60,000 trips. 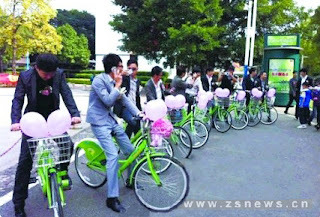 This makes Kunshan Public Bicycle, the most active system in China and the World! 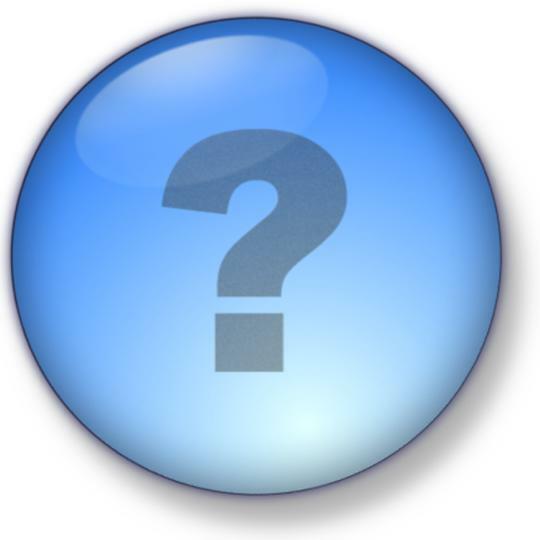 What contributes to the kind of huge usage? There are many factors. Firstly, there is a very low subscription price in the form of a deposit and the simplicity of paying overage charges, after the initial free first hour, are subtracted from the subscribers "added value card". Secondly, there is incredible ease-of-use of the system. 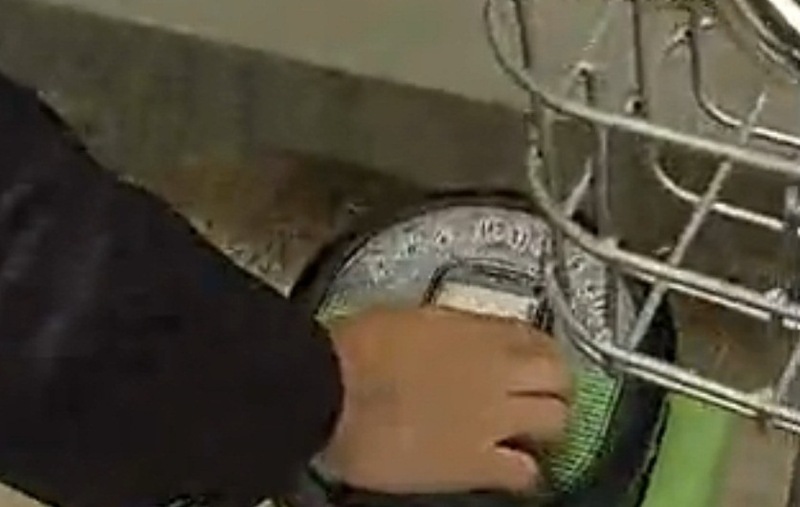 Mobile telephones can be used in place of the subscription cards to swipe at the individual docks to unlock the bikes. There are no numbers to compose or need to have a card at hand. Then, there is a certain bicycle ethos with the population of Kunshan. It is the city where Shimano, one of the world's largest bicycle component manufactures has its China factory. Also you can be sure, there is no mandatory bicycle helmet law in Kunshan to stand in the way of serendipitous usage! 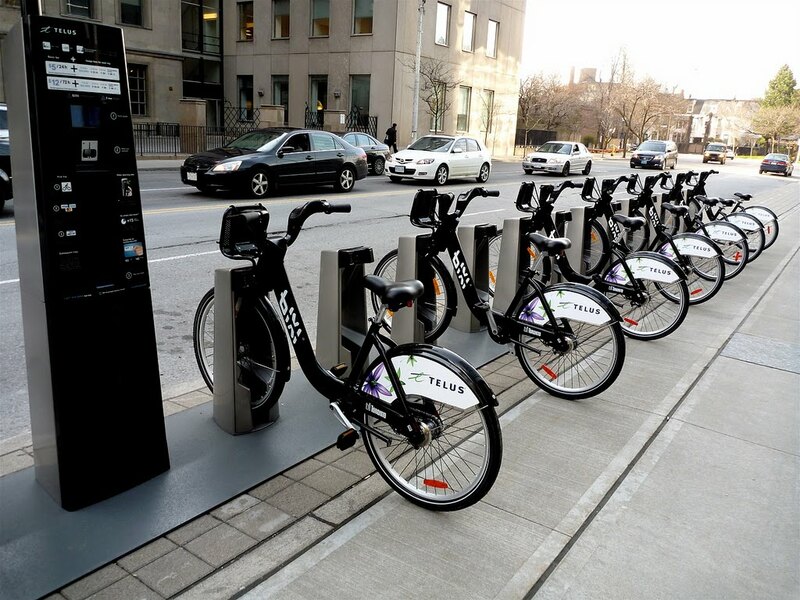 The first two weeks of December finds many of the larger bike-sharing systems in the northern part of North America pulling up stakes and going into hibernation for the winter, however, Toronto bIXI is an exception. Keeping the system open through January, February and March 2012, Canada will remain a bike-sharing nation in the winter. They will show that they can roll with a chill in the air. 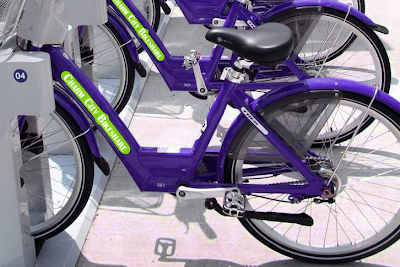 The state of Florida will start its second major bike-sharing system with Broward B-cycle on December 14. If you are sunning yourself on the beaches of Ft. Lauderdale, Pompano Beach, or Hollywood (the other one), you will have three opportunities to join the opening celebrations, see these times and locations. There will be around 20 stations and 202 bikes in the eastern part of the county to start and more coming in 2012. Also, if you subscribe to the system before the end of this year, you can get $10.00 off the $45 annual subscription price by using this special code (BCYCLE2011). 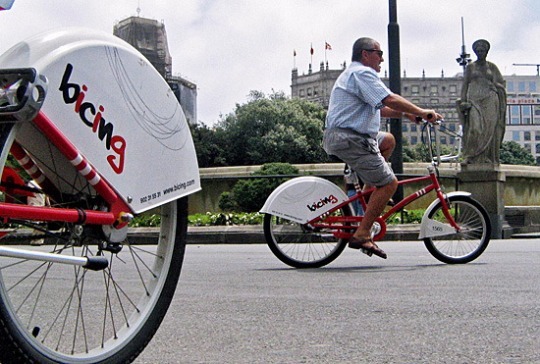 Ecobici is a few months shy of its second birthday and is reporting increased usage numbers. 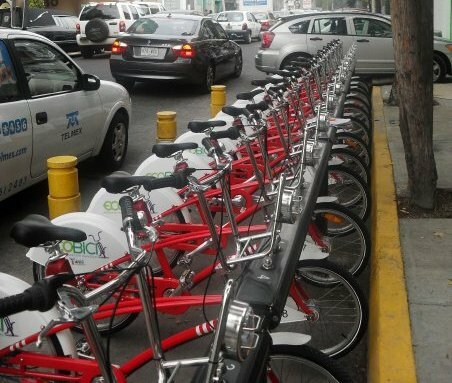 According to lainformacion, Ecobici's 30,000 subscribers have taken over 3,000,000 trips as of the beginning of this month, compared to a total of 2 million last year. With daily usage now around 8 trips per bike, it is not the same as Kunshan, but it is very respectable. As with most of the Scandinavian bike-sharing systems and some in North America, many of Germany's Call A Bike systems will also go into hibernation for the winter months this week. The larger systems of Hamburg, Berlin, and Stuttgart will remain open, but for those that close, there is the Winterpause Take It Home service. To help its subscribers who want to ride through the cold winter months, for €60 ($80 US) a bike-share bike can be rented and used as a personal bike until the system re-opens in April. I will gladly rent you one of my bikes for this amount during the winter as well! 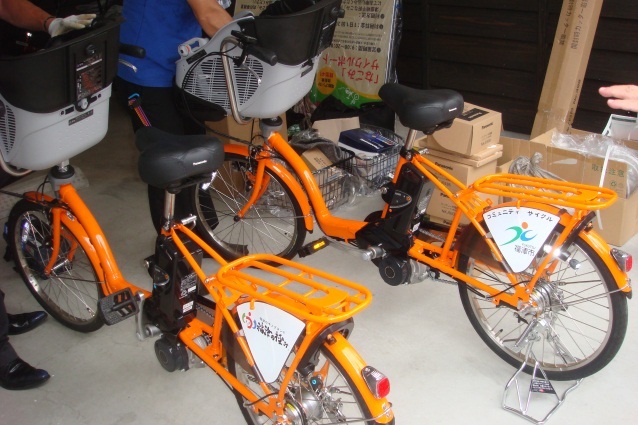 Electric-assist bicycles with child seats recently appeared in a bike-sharing system in Japan as part of the Fukutsu Community Cycle. 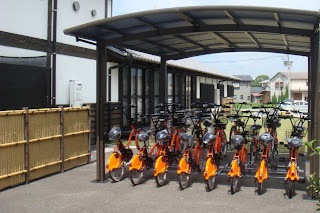 On September 4, Fukutsu City, in the Fukuoka Prefecture of Japan, launched a one-year bike-share pilot project which will run until August 31, 2012. The city is managing the project and electric-assisted bicycles were developed by Panasonic and the non-profit Town Mobile Network Kitakyushu, who are also operating the electric-assisted bike-sharing service in Kitakyushu City, Fukuoka Prefecture, Japan (as detailed in The Bike-sharing Blog earlier this year). The Fukutsu service consists of 30 electric-assisted bikes, four of which have child seats. Users sign up for the service online or at any manned stations. The bikes cost 200 Yen (US $2.60) per day. Bike-sharing can be very romantic. A chance meeting at a docking station, a smile while passing one another on the street, or a knowing glance while waiting for the traffic signal to change could just be the beginning of many shared rides together. Bike-sharing is very romantic. Over last weekend in Zhongzhan, China, a groom and his best men used the bike-sharing system to pick up the bride and go to their wedding. With millions and millions of rides on bike-shared bikes in the last few years, it's no wonder that the world is in love with bike-sharing. Bicycling is good for physical health, environmental health, and the alleviation of traffic congestion, so encouraging bikes use is an essential public priority. Design firm LUNAR Europe, Green City e.V., and the University of Wuppertal, all based in Germany, have partnered to develop mo’, which offers compensation for the use of bicycles and public transportation. 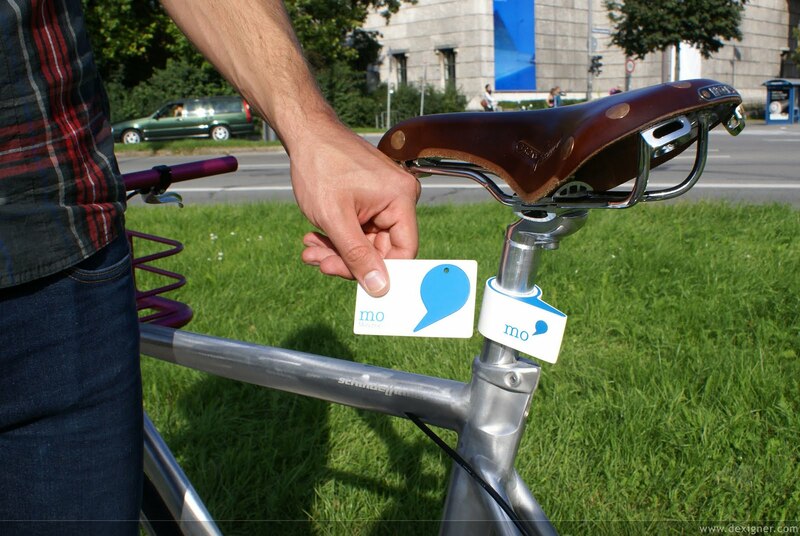 mo’ subscribers use their smartcard to rent standard bikes, cargobikes, ebikes, and cars, as well as use public transportation. Subscribers collect mo’ miles by riding bicycles or “eco-friendly transport” and the more mo’ miles one has, the cheaper it is to rent a car. What could be mo' better than that? p.s. - This is The Bike-sharing Blog's 300th post! We can't wait to see what the next 300 mo' posts will be about. The bike-sharing world was all abuzz in August with the cite in The Bike-sharing Blog about the study in The British Medical Journal that used data from Bicing in Barcelona to conclude that "bike-sharing saves lives." 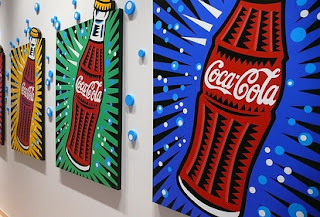 This study was funded by the Coca-Cola Foundation which has as one of its missions: "to support access to exercise, physical activity and nutritional education programs, programs that motivate behavior modification, and programs that encourage lifestyle/behavioral changes." The Foundation continues to fund TAPAS (Transportation, Air Pollution and Physical Activities) which will oversee similar studies on the health benefits of bike-sharing in Paris, Copenhagen, Basel, Warsaw and Prague. It is very worthwhile that these benefits are substantiated with scholarly studies. It is ironic though, that these studies are funded by a company which makes the high sugar content soft drinks that are a major cause of the obesity and type II diabetes from which many populations in the world are suffering. Eradication of these conditions is often cited as one of the goals of the operators of bike sharing systems. We at The Bike-sharing Blog will update you with the findings of these new studies as they are available. Oh, yes share a Coke with a friend! Contracts for bike-sharing services between the municipality and operator are hard to find on the websites of local governments and some governments even prefer not to make the contract public. One would think the contract for a public service would be... well... public. The Bike-sharing Blog needs your help! To benefit the Bike-sharing Community, send a link to your municipality's bike-sharing contract to us, so we may publish the link for the benefit of all. 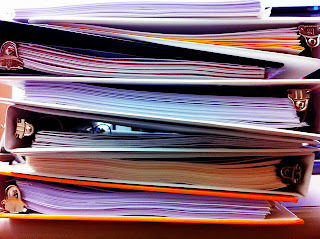 The Contracts section on the bottom left corner of the Blog needs beefing up as only two contracts are presently listed -- that of London, England, UK (Barclays Cycle Hire) and Arlington, Virginia, USA (Capital Bikeshare). In France, an endearing term for the Vélib' bikes are the petites reines, or little queens. This gives Parisian bike-sharers an air of royalty. Recent reports in British tabloids say that London royals Prince William and Princess Kate are using the little queens of Barclays Cycle Hire to get around London when they are in town visiting that other Queen. 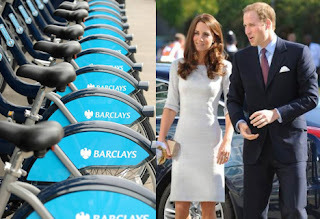 According to the Evening Standard, the royal couple have been seen using the bike-sharing system around the city. Their usage has been confirmed by a spokesperson from St. James Palace. It seems though that the royal couple does not use their "Boris Bike Tandem" wedding present, as seen in The Bike-sharing Blog in April, but travel on their own little queen. On October 26th, easyBike will be launching a new bike-sharing system in Nicosia, Cyprus. There will be around 300 bikes distributed through 27 stations in the greater Nicosia area. The system is a collaborative effort between the Greek company easyBike and the French company Smoove. In less than two weeks, Washington, DC's and Arlington, VA's Capital Bikeshare will increase the cost of its causal user daily pass from $5 US to $7 US and change the $15 US 5-day pass to a 3-day pass, reports The Washington Post. Also, a recent decision will now allow Capital Bikeshare stations to be placed in one of Washington's most visited tourist areas, the National Mall. Could it be that the idea behind raising the price is the hope that now many more of the thousands of visitors to the Nation's Capital will use the system to sight-see and therefore help raise the capital needed to expand Capital Bikeshare! News reports out of Chattanooga say that Bike Chattanooga, the 300-bike/30-station system expected to launch next month, has been delayed until sometime in 2012. It seems that elements of the proposed system can not meet the "Buy American" clause of the Federal Transportation funding at this time. Update: October 26, 2011, In response to what was reported in local Chattanooga news concerning the postponement of the launch of Bike Chattanooga, Philip Pugliese, Bicycle Coordinator, Outdoor Chattanooga, has informed the Bike-sharing Blog that the current system delay is fully associated with production timing and has nothing to do with Buy America or other Federal Transportation Administration issues. He wrote that while complexities associated with federal funding did take longer than expected, all have been resolved to everyone’s satisfaction. Last week, the student inspired Bici-K bike-sharing began operation in Medellín, Colombia. The Bike-sharing Blog in August reported on these efforts. This inspiration has now become EnCicla which has deployed 145 bicycles in 6 stations over two different areas of Medellín. While it appears that the program was created to facilitate easier connections between two major universities and public transit, the system will have limited enrollment. EnCicla offers bikes for urban and trail use, so it is available for both transportation and recreation. The system was financed by the metropolitan government and the universities. We hope to see this program prosper and expand to serve all of Medellín. 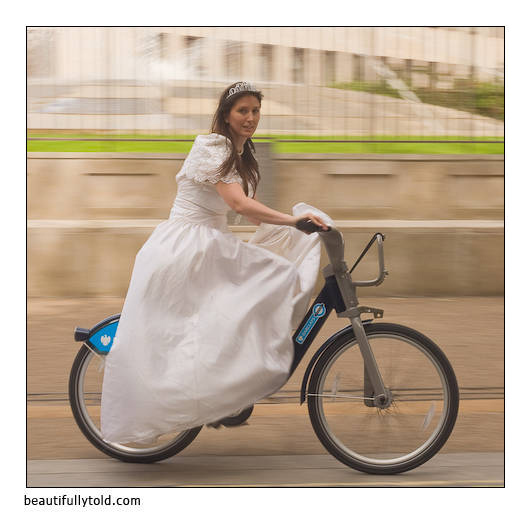 Bike-sharing cleans up in the United Kingdom. This morning is the official launch of Bike in Bath. This 58-bike, 4-station system has been in trials in Bath, England for two weeks. Though small, it is of big interest because the system is equipped and operated by Bicincittà. This will be the first Bicincittà system in the UK and complements the 70 bike-sharing programs it operates in Italy. The system is funded by the European Union-backed Civitas Renaissance initiative, which helps cities across Europe achieve more sustainable, clean, and energy-efficient urban transport systems. Mid-September brought a new bike-sharing program to France's 4th largest city, Lille. 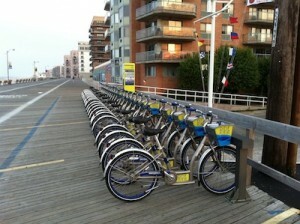 V'Lille merges both a self-service component and longer terms bike rentals into the same system. There are 1,100 bikes in 110 self-service stations. The system will expand in April of next year to serve not only Lille, but the contiguous cities of Roubaix, Tourcoing, and Villeneuve-d'Ascq. Only around 50% of the stations have kiosks which take credit cards to sign up for the one-day or seven-day subscription on the spot. All subscription periods are available online. The costs are reasonable: a day pass is €1.40 ($1.85 US), a week is €7 ($9.40 US), and the year is €36 ($48.50 US). Go over the first free 30 minutes and it costs €1 ($1.35 US) for each additional 1/2 hour. Don't want a self-service bike, but one to keep and use like a personal bike without buying one? V'Lille has 3,000 bikes to rent for one month at €5 ($6.70 US), 9 months at €27 ($36.40 US), and one year at €36. The bikes can be rented with accessories like a child seat. The long-term rental bikes cannot be docked at the stations. Within days of the announcement of the NYC Bikeshare program, Chicago, Illinois issued a Request for Proposal (RFP) for a 3,000-bike system to be operational by June 2012. This RFP has a very aggressive time table to put Chicago's system on the ground close to the time of New York City's. Chicago wants to increase the size of its system to have 5,000 bikes in 500 stations within 24 months of operation. It will be entertaining to watch this bicycle race between these two cities. November should bring two new bike-sharing programs to the United States. Broward B-cycle serving Broward County, Florida, which includes Fort Lauderdale, is readying around 200 bikes to give south Florida its second bike-sharing system. Chattanooga, Tennessee is also readying Bike Chattanooga to launch with 300 bikes throughout 30 stations. We hope that more southern cities in the United States will not be very far behind. The Cities of Copenhagen and Frederiksberg, as well as public transport operators Metroselskabet and DSB, have entered a collaboration on the development and establishment of a bike-sharing system. At a later stage, the system could be offered to other organizations, such as other cities, public entities, private enterprises, and the like. 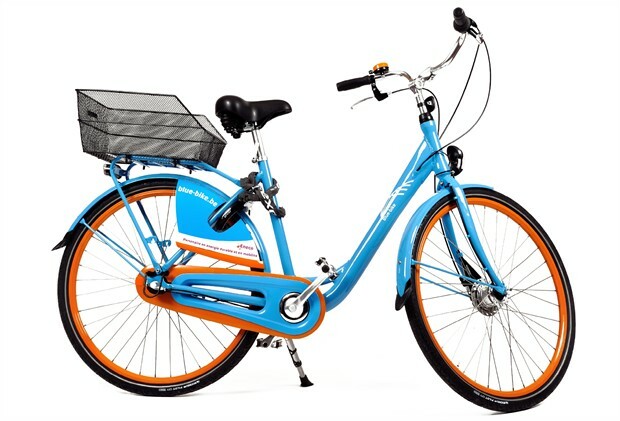 The task of establishing, operating, and maintaining the bike-sharing-system will be EU-tendered in December 2011. In the beginning of October 2011 a tender notice will be published and the prequalification will start. In connection with the prequalification, an informational meeting for potential bidders will be held on October 4th to inform about the practical matters regarding the tender. 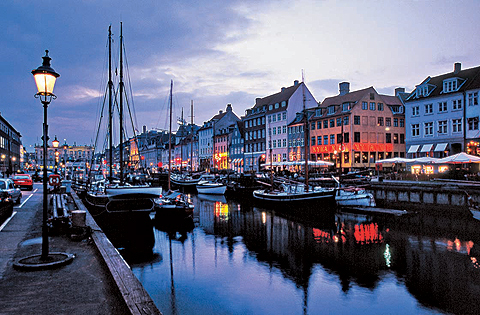 The meeting will take place at DSB, Sølvgade 40B, from 4-6pm local time. Registration for the information meeting can be made no later than October 3rd at noon by sending an email to Kim Guldbrandsen at kgu@dsb.dk. Their vision is to give citizens, customers of public transport, tourists, and visitors in the city the possibility of using a door-to-door public transport system, and not only between train or bus stations. This will be secured by connecting the existing public transportation system, which focuses on transportation of many people over long distances with high comfort and short travel times, with the high flexibility of a bike. This generates increased accessibility to business parks, residential, shopping, and other areas of interest, which today are rarely serviced by public transport or where the existing network does not offer an attractive service. 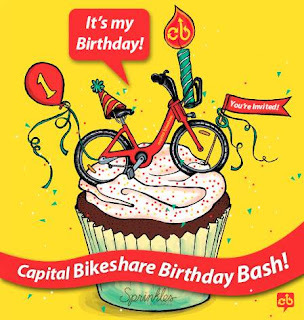 Capital Bikeshare is turning 1 year old on September 20th. We made it and it's been a blast! As we approach our 1st birthday, we're also approaching our 1,000,000th trip. Today with about 985,000 trips we are closing in on this milestone quickly. Will we make it to the big number before our 1st birthday? I'm guessing yes. When my company, MetroBike, was involved in creating Capital Bikeshare, we didn't know how well it would be embraced by the public. And now one year later, it's far exceeded our expectations. If you know of any Japanese reality TV shows wanting to film the 1,000,000th trip, let me know. As we reported on The Bike-sharing Blog in June, Velib' had fun with this for trip #100,000,000, so why wait for Capital Bikeshare? Come help us celebrate our first birthday. 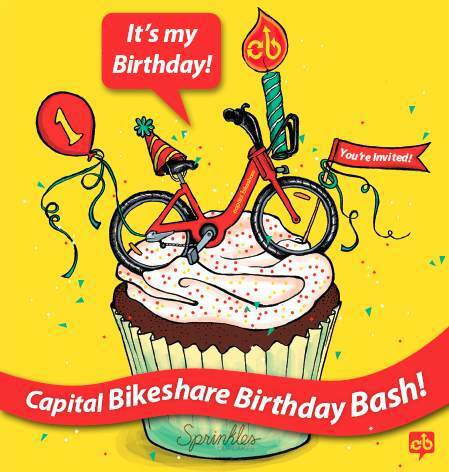 If you're in town on September 22, World Car-free Day, join us as we celebrate the huge success of Capital Bikeshare. No one thought CaBi, as it's called locally, would be such a game-changer for the Washington, DC region. Not only are more stations and bikes coming on-line over the following months in DC and Arlington, but more jurisdictions in the region are interested in being part of the service. 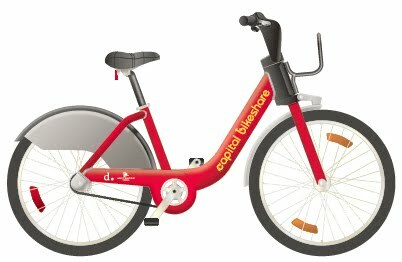 This would make Capital Bikeshare one of the largest regional bike-sharing services in the world. Now with so many more bike trips in the nation's capital, you'll have a difficult time even finding a car on Pennsylvania Avenue. OK, a slight stretch of my imagination, but you get the picture. We'll see you on the 22nd. And make that extra trip on a CaBi to get us that much closer. And from MetroBike, thanks a million! UPDATE (9/20/11): We reached 1,000,000 trips today on our birthday. Here's the press release. This afternoon the New York City Department of Transportation announced that it will begin its bike-sharing on April 1, 2012 with a 10,000-bike, 600-station program operated by Alta Bicycle Share. The service, dubbed NYC Bike Share is expected to cover a part of New York's borough of Manhattan, south of 79th Street, and parts of the borough of Brooklyn. 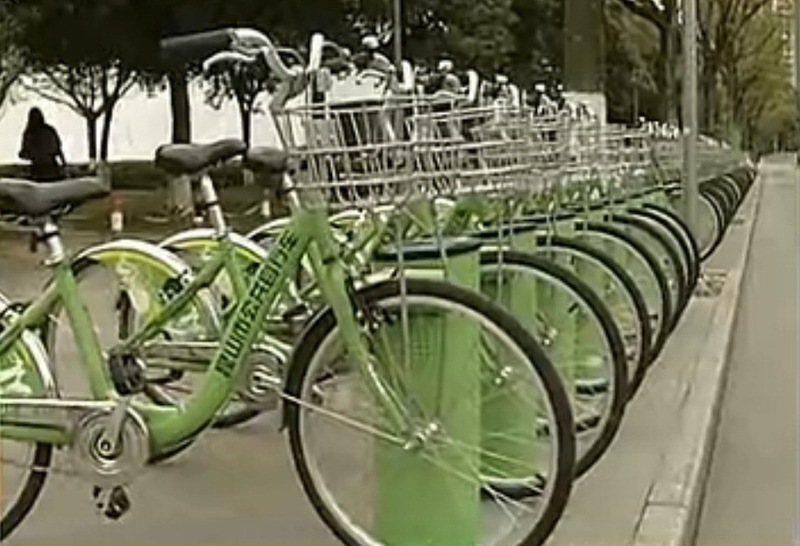 The program will use the Public Bicycle System Company equipment which is also in use in Washington, DC/Arlington, Boston, Minneapolis, Toronto, Montreal, Melbourne, and London. A 2-month test period with 30 stations is scheduled to begin before the April launch of the system. New Yorkers and visitors can take part in helping "to shape the system" using a special station placement locator map. Bike-sharing and Beer: A Good Mix? 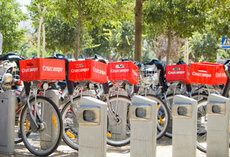 Recently, JCDecaux began selling advertising space on the bikes of its SEVici bike-sharing system in Seville, Spain. 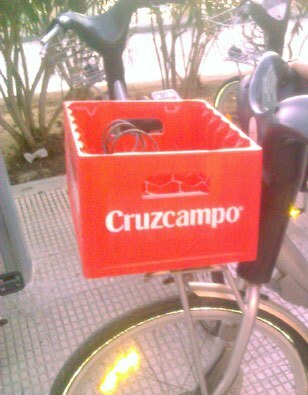 It cleverly created a new front basket on the bikes that looks like the carrying case for Cruzcampo Cervesa, a beer brewed by Heinekin. A local consumer association believes that these new front baskets violate the region's laws concerning the advertising of alcohol in a sports related activity involving minors. The local group is demanding the advertising be removed, as reported in laopiniondemalaga. Are these utilitarian vehicles used for sports? According to El Correo de Andalucia, "This service as transport already has 60,000 users per day which means that 6.6% of all journeys are made in the city are by bike." Are there minors using them? According to SEVici, 14 to 18 years-olds are allowed to use the system, but only with written permission from parents or guardians. Advertising has always been intertwined with 3rd generation bike-sharing. The first systems were paid almost solely by advertising revenue, either off-site or on the bikes. Then different business models distanced the bikes from advertising. Now there is a strong movement for "peddle while one pedals" in bike-sharing. 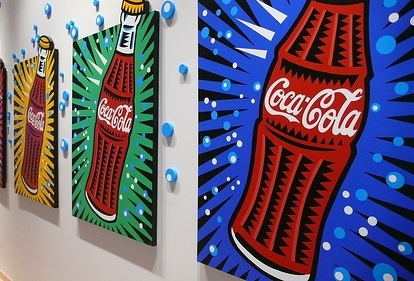 As these systems grow, it is becoming evident that income from advertising is a necessity to pay for the increasing cost to maintain the systems. 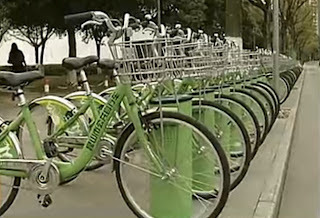 The Bike-sharing Blog and the bike-sharing world will be watching how this controversy unfolds. Since we all know that bike-sharing systems are created to serve the public, or in this case should we say "cervesa" the public, whether they are with or without advertising. Baltimore, Maryland is in advanced stages of negotiations with B-cycle to be the one of the next mid-Atlantic cities in the United States to bring bike-sharing to its citizens. 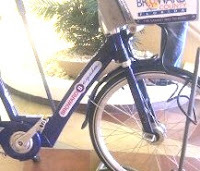 With 250 bikes in 30 stations under discussion, the plan is to deploy the system around July 2012 in the Central Business District (CBD) and in the area just to the southeast of it. Because Baltimore is such a gracious city, with a dash of southern hospitality, the bike system will be called Charm City Bikeshare. It will complement the Charm City Circulator a free bus transit system which makes connections in the CBD. 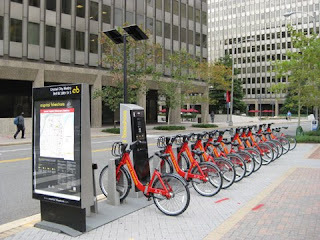 Baltimore, around 65 km (40 miles) north of Washington, DC, is close to initiating bike-sharing as well as New York City, NY is soon to announce a system to begin in spring 2012. With the New Balance Hubway spinning smoothly through Boston, MA, bike-sharing is developing in most of the major US cities in northeast corridor. Unfortunately, there will remain a gaping void in the center of this string of bike-sharing cities because one major city does not yet understand the importance of bike-sharing's role in public transportation. Which US city has the largest bike-sharing program today? On paper it is Capital Bikeshare of Washington, DC and Arlington, VA with 1,100 bikes in 114 stations, but Nice Ride Minnesota has been expanding this summer and surpasses Capital Bikeshare with the actual number of bikes available on the streets during some days. It's like watching a pennant race between two cities. That is a baseball sports contest for our non US readers. Like baseball, that race will end in the late fall when Nice Ride goes into hibernation for the winter! 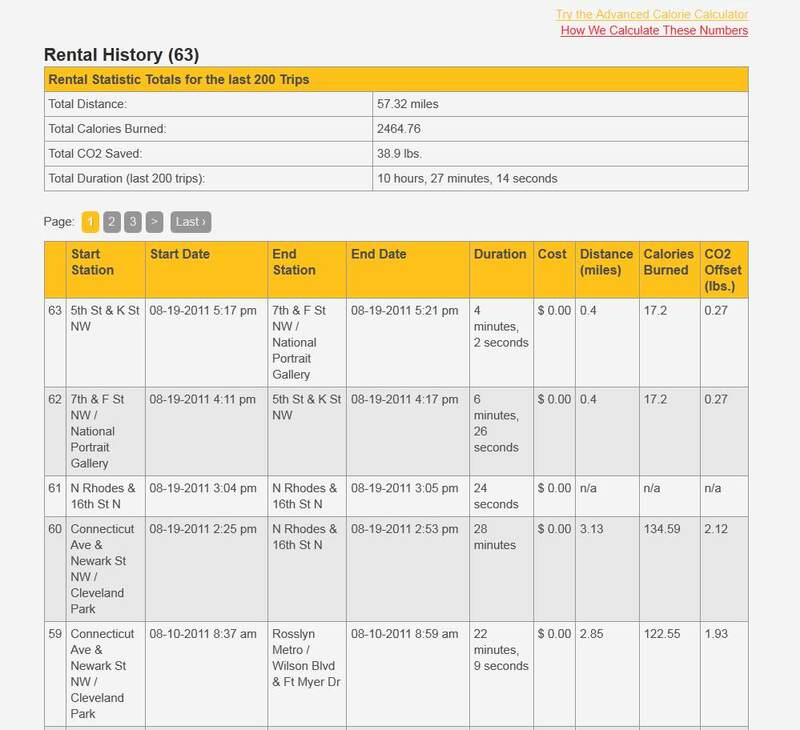 One month before its first birthday Capital Bikeshare has released a new feature on its website that allows members to review total distance, calories burned, and carbon footprint reduction for their 200 most recent trips. The distances are measured "as-the-crow-flies" in a straight line between stations. 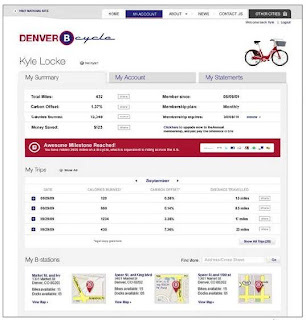 B-Cycle also boasts personal profile pages in its nine bike-sharing operations across the country. Distance in these programs is measured by a GPS device located within each bike, from which calories burned and carbon avoided are extrapolated. Members can also track the duration of their trips, allowing them to see where they may have accumulated any fees. 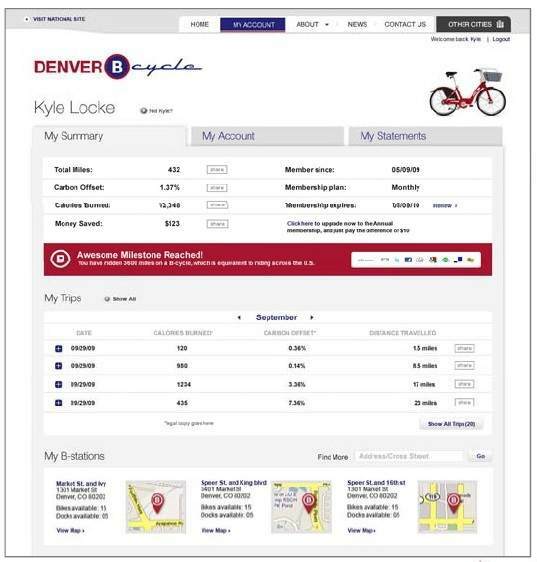 For those without a local bike-share, B-cycle offers the B-effect, where any individual can enter his/her zip code to find out what a B-cycle bike-share would look like in their city. B-effect uses the population of a city to determine how many "B-stands" and cycles it would need, but also calculates how many calories burned, pounds lost, carbon emissions reduced, money saved, and traffic reduced would result from just 10% of that city’s population using the service for only 30 miles. While a 10% bike mode share is enviable for ALL American cities and most around the world, by the time the B-effect page asks "Want B-cycle in your community? ", it has already built quite a convincing case. 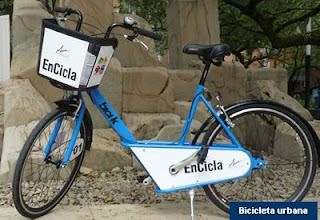 This September, Medellín, Colombia will unveil 160 public bicycles in the form of a pilot bike-sharing program. The bikes, featuring GPS tracking software and swipe card stations, cost the city about $500 each and will be free to use for up to 30 minutes from 5:30am to 7:30pm. The bikes were developed by three engineering students at Eafit University, who have dubbed their bikes "Bici K". The service is modeled after Santiago’s successful bike-sharing program, where users can sign up online or at one of the automated kiosks. The program will cut down on operational costs by partnering with the local Eafit University, from which 20 – 30 students will be hired to help manage the program. 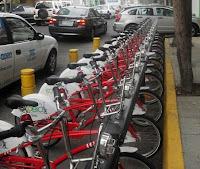 In 2008, the District Council of Bogotá, the capital and largest city in Colombia, passed Agreement 346 to establish a bike-sharing service, "Bike-Bogota", but in the two years since, there has yet to be a feasibility study. If Medellín’s system’s is assessed as a success in December, it will expand with more bikes and more stations. Hopefully, this will help encourage Bogotá to take action on its mandate. Tulsa Townies is a recreational community bicycle program which promotes healthier lifestyles and began in Tulsa, Oklahoma, USA in August 2007. 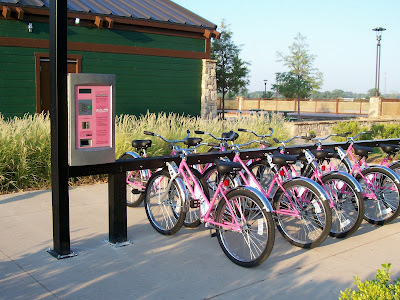 It was the first application in North America of a solar-powered, automated, network of stations which allowed pick up and drop off of bikes at any of four locations along the Tulsa River. This program was the seed of 3rd generation bike-sharing in North America that grew first into the Humana Freewheelin' program and then matured into the B-cycle bike-sharing services and spawned Decobike as well. Also last week, Oklahoma City, Oklahoma, USA, announced it was planning to join the growing list of American cities offering its citizens bike-sharing as public transportation. At the same time, as highlighted in The Bike Sharing Blog, a study in The British Medical Journal reported that bike-sharing saves lives. Maybe these events can all spur the Townies into fulfilling its healthier lifestyle ideal to more of Tulsa by moving from just being a recreational program into bike-sharing as transportation. For now, enjoy a ride along the Tulsa River Parks with the Townies. It's free with only a $10 refundable deposit! The Bike-sharing Blog is interested in better understanding our audience and what we can do to make the Blog even better for you. We have a short survey that will take two minutes to answer and we would appreciate your response. Click here to take The Bike-sharing Blog survey. Thank you from Paul, Russell, and Jesse at The Bike-sharing Blog. A new report in The British Medical Journal provides more analysis that confirms: bike-sharing saves lives. For this study, titled "The health risks and benefits of cycling in urban environments compared with car use: health impact assessment study" by David Rojas-Rueda, Audrey de Nazelle, Marko Tainio, and Mark J. Nieuwenhuijsen, the authors surveyed 181,982 Bicing subscribers in Barcelona and found "[c]ompared with car users the estimated annual change in mortality of the Barcelona residents using Bicing (n=181,982) was 0.03 deaths from road traffic incidents and 0.13 deaths from air pollution. As a result of physical activity, 12.46 deaths were avoided (benefit:risk ratio 77). The annual number of deaths avoided was 12.28. As a result of journeys by Bicing, annual carbon dioxide emissions were reduced by an estimated 9,062,344 kg." In other words, bike-sharing is good for you and the air we breathe. 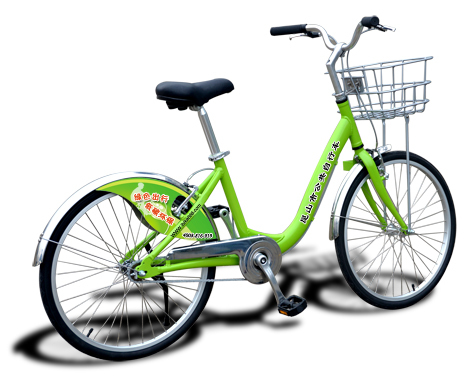 Bike-sharing services are usually implemented by transport agencies. With research such as this, it shows that bike-sharing is an interdisciplinary matter and therefore should garner further cooperation by public health agencies as some jurisdictions already have begun. Today's post has little to do with bike-sharing, but it's a funny video coming from Vilnius, Lithuania showing Mayor Arturas Zuokas taking care of business and removing cars which are illegally parked in a bike lane with his own personal style -- using a tank. Whether real or a While set-up, Vilnius has no bike-sharing service yet, but with the political will of such a mayor to improve conditions for cyclists, I wouldn't give it long until they see a bike-sharing service of their own. A lot has been going on in the Bike-sharing World over the past few weeks. Let's get started. 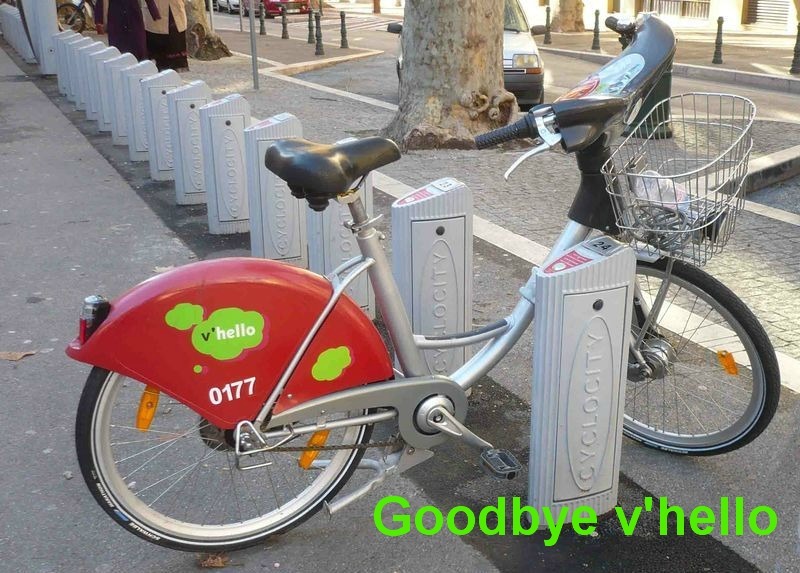 Paris: Vélib' celebrated its 4e anniversaire last month by now averaging 75,000 daily trips on the ubiquitous grey bikes. After a period of flat growth, the first quarter of this year has seen the greatest increase of usage yet, and 20,000 new subscribers according to France3. London: For Boris Bike's first birthday a few days ago, Mayor Boris Johnson confirmed that Barclays is extending its sponsorship of the system with another £25 million ($41 million USD) to expand the popular program into the western Boroughs of Hammersmith and Fulham in 2013. This is in addition to the current eastern expansion for next summer's Olympics. Barclays Cycle Hire, with only one forth the number of bikes as Paris, realizes around 25,000 trips daily, around 1/3 of the 75,000 in Paris. That is definitely something to bank on! Newcastle on Tyne, UK: A new mobile phone bike-share scheme, Scratchbike, has begun with 150 bikes tethered to 15 racks in the central Newcastle. The program is sponsored by NE1, the Newcastle Business Improvement Company. It is scheduled to be a city-wide service, which incidentally began as a student-run program at Newcastle University. Dublin, Ireland: Dublinbikes two weeks ago reached an all time high of 6,280 rentals in one day! That's around 12 trips per bike per day! Dublinbikes is at the top of the list of the most successful bike-sharing systems in the world. This summer it has added 4 new stations and is adding another 100 bikes to bring its fleet up to 550. Belgium- Blue-bike recently set up 35 locations with around 1,000 bikes at train stations in cities and towns throughout the northern part of Belgium. It's mostly a pick up and return to same location system. It is similar to the original concept of the Deutsche Bahn Call-a-Bike system at rail stations. As Call-a-Bike has matured, it has become a multiple fixed locations bike-sharing system in many German cities. One may pick up a bike at one location and return it to another. 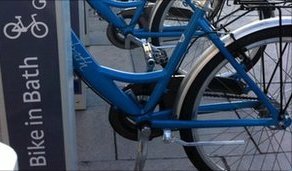 The service is similar to The Netherlands' OV-fiets service.The Bike-sharing Blog hopes the same for Blue-bike as it matures. An online sign up for a membership card is needed to rent these bikes. The card costs €31 ($45 USD) and the daily rate of €3.50 ($5 USD). Also in Belgium, a bike-sharing system with 240 bikes is coming to the city of Namurs. 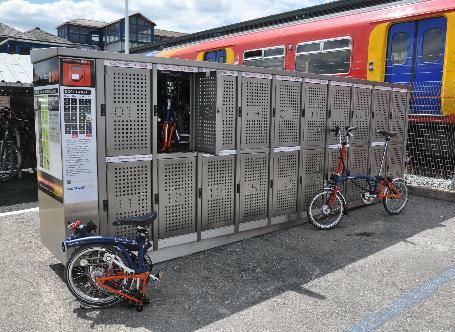 United Kingdom: Brompton Docks is a "left luggage lockers" folding bike rental system piloted this summer at a suburban London train station. These Brompton folding bikes must be replaced in the same set of lockers from which they were removed. 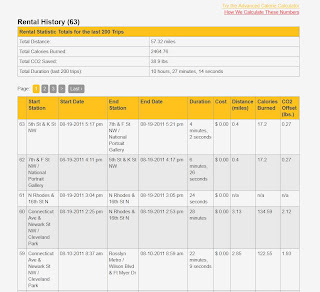 Renting cost starts at £4 ($6.50 USD) for one day to £1.60 ($2.60 USD) for 23 days or more. As with the Belgium system, a membership and a smart card are needed. 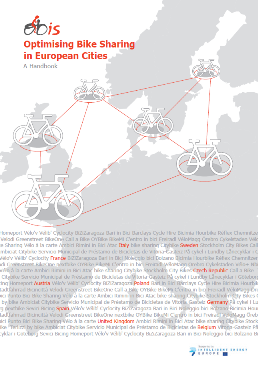 The Optimizing Bike Sharing in European Cities (OBIS) handbook has three years worth of data from studying bike-sharing in 10 European counties to identify the best practices, success factors, limits and market potentials, and the optimized strategies. This guide has published in it the authors' key findings and recommendations as a comprehensive manual in the form of a handbook. Read The Bike-sharing Blog's March posting about the OBIS Project and Final Conference. Download a copy of this handbook here. The ax falls on bike-sharing in Aix-en-Provence, France. After almost four years V'Hello said its last adieu in May to the citizens of this southern French city. With only 143 users, the municipal government felt it was financially better to cancel its contract for the 200-bike, 16-station service with JCDecaux rather than to keep it. According to LePoint, even with low usage, the outdoor advertising company wanted to charge Aix-en-Provence over €400 ($575 USD) more per bike per year than it charges Paris to maintain the system. Batumi, Georgia: This resort town on the Black Sea now has a 120-bike and 10-station bike-sharing program as BatumVelo began three weeks ago. The program uses the Smoove technology. Whether one subscribes or is a casual user, there is no free usage time. 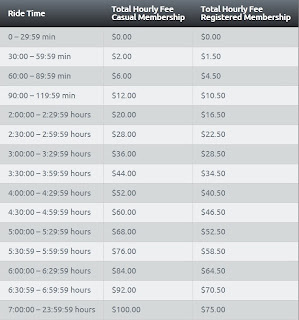 For every 15 minutes of use the subscriber pays 0.50GEL ($0.30 USD) or the casual user pays 0.75GEL ($0.45 USD) whether going to the beach or pedaling around town. Long Beach, New York: The South Beach Miami DecoBike has landed a 400 bike and 40 station contract making a beach head in New York State. Long Beach, New York, which is just next to New York City on Long Island, is scheduled to have its fully operational bike-sharing program in September. Getting to the sands of the Atlantic Ocean from the Long Island Railroad Station will be a breeze on a DecoBike Long Beach. While talking about New York, for the last two years at Summer Streets in New York City, there have been bike-sharing demonstrations as part of the activities. Will there be a bike-sharing contract announcement this year? The Bike-sharing Blog expects Chattanooga, Tennessee also to begin a bike sharing program soon. According to Outdoor Chattanooga, there will be 30 bike stations located around the central business district, the UTC campus and the North Shore. 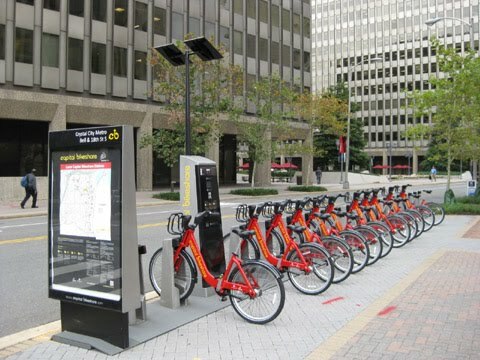 The system will use the same style bike as the Washington, DC/Arlington, Boston, and Minneapolis programs. Hangzhou, China: According to the HHN Information Center, the Hangzhou Public Transport Company says that, as of now, there are usually around 200,000 daily usages of the system. Generally, each bike is used around 5 times a day.The the highest single day usage was 320,000 rides. There are currently 2,416 service points for 60,600 bicycles. This morning New Balance Hubway is up and running in Boston. This brings Boston into the select group of North American cities with major bike-sharing systems. Although New Balance Hubway is planned as a regional system, it starts with a Phase I of around 600 bikes in about 60 stations in the central parts of Boston. Already the adjacent municipalities of Cambridge, Somerville, and Brookline are exploring having Hubway stations, according to the Boston Globe. There is a handy user-friendly Request A Station Locator Map where anyone can suggest a station location in the region. The expansion of the system is a shoe-in with the New Balance Company as its naming sponsor. Even with only 600 bikes, New Balance Hubway has installed a few large docking stations in the expectation of a many members. Although the system will only run spring through fall, the yearly subscription of $85 is a bit more than its sister program Capital Bikeshare in Washington, D.C. and Arlington, Virginia. For $10 more, you get a few months less. Both services are operated by the same company, Alta Bicycle Share, however, pricing is set by the governments for Capital Bikeshare and likely the same is true with Hubway. In a very interesting twist on usage fees, New Balance Hubway is charging around 25% more to its 1-day and 3-day "casual" users over what it charges its annual members who keep the bike over the first 29 minutes (below). The Bike-sharing Blog welcomes Boston and its region to the bike-sharing world.